Is The Mermaid Inn haunted? 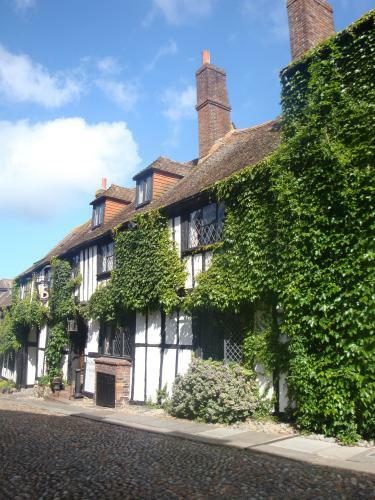 The Mermaid Inn is one of Englands oldest pubs with parts of the Normal cellar dating back to 1156 and the rest of the building was rebuilt in 1420 into the building that stands today. Currently the Inn is owned by two local residents and over the years has been visited by artists of stage and screen, musicians, politicians of the day and royalty, including HRH Elizabeth, the Queen Mother, HRH Prince Edward, Warren Beatty, Charlie Chaplin, Pierce Brosnan, Andy Garcia and even Johnny Depp. The pub is reputidly filled with secret passages, priest-holes and sliding wall panels, which may have come in handy for pirates and smugglers due to the close proximity of the inn to the sea. Judith Blincow, who is the joint owner of the Mermaid Inn came downstairs one morning to find 2 of her guests sleeping on the couch in the lounge. The couple refused to go back up to their room claiming they'd seen ghostly figures walk through walls in the room. A previous landlord was approached by a local medium, convinced that the pub would be the perfect location to arrange a ghost watch. Both the medium and the landlord witnessed two ghostly figures who appeared and drew their rapiers and started to duel. The landlord witnessed this fight to its end and, when it concluded, the victor ran his sword through his opponent's chest, then removed a floorboard and disposed of the dead man's body. Other paranormal stories include the many sightings of a lady in grey, and a chambermaid who was supposedly murdered by a smuggler for talking too much about his criminal exploits. Also a few years ago a barman was tending to the fire when bottles at the end of the room flew off the shelf, he handed in his notice the next day. Then there's the woman who moves clothes around and the man in old-fashioned garments that takes to sitting on occupied beds. Rooms turn cold for no reason, rocking chairs move of their own accord.